In the last post I have presented the complementary labyrinth. I did this with the example of the basic type labyrinth. This is a self-dual labyrinth. 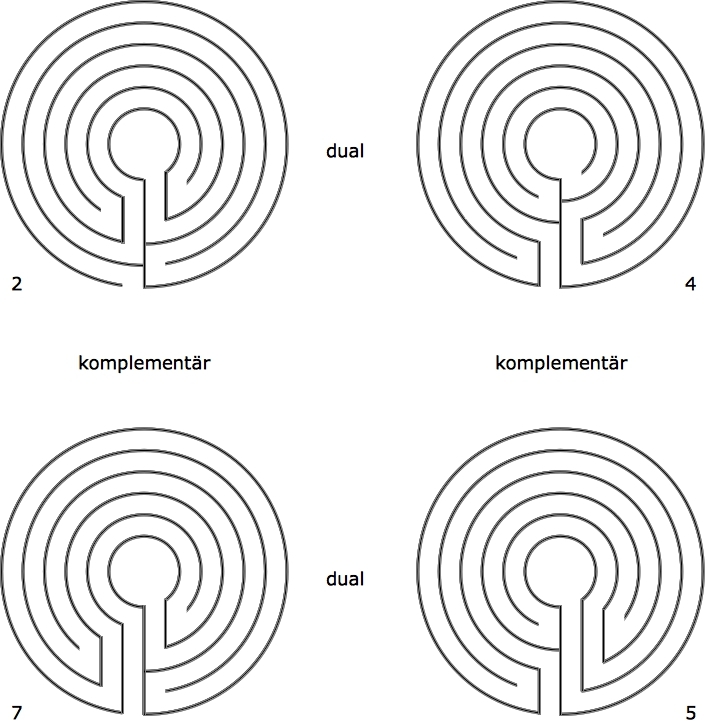 The complementary is different from the dual labyrinth. This can be better shown using non-self-dual labyrinths. I want tho show this here and for this choose an alternating labyrinth with 1 arm and 5 circuits. As already shown in this blog, there exist 8 such labyrinths (see related post below: Considerung Meanders and Labyrinths). Of these, 4 are self-dual (labyrinths 1, 3, 6, and 8) and 4 are not self-dual (labyrinths 2, 4, 5, and 7). Figure 1 shows the result of performing these actions with pattern 2. So we have already three labyrinths. Now it is possible to go even further. Rotating the dual again brings it back to the original labyrinth. However, the dual can also be mirrored. This results then in the complementary of the dual. And similarly, the complementary can be rotated, which results in the dual to the complementary. Rotation of the complementary (pattern 7) leads to the dual of it – which is also pattern 5. Figure 2 shows the labyrinths corresponding to the patterns. The labyrinths are presented in basic form (i.e shown with their walls delimiting the pathway) in the concentric style. 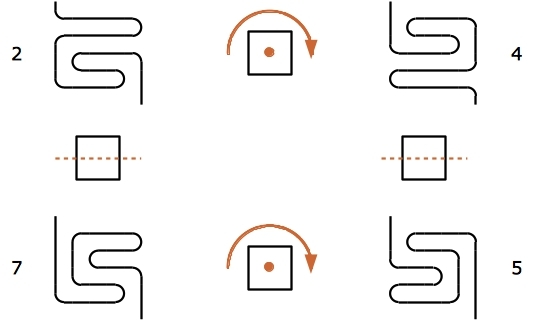 All four non-self-dual alternating labyrinths with 1 arm and 5 circuits are in a relation of either dualtiy or complementarity to each other.